Are you an alpaca breeder or do you provide an alpaca service or product? 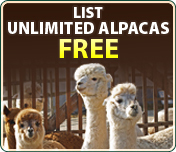 Take advantage of our popular, high traffic alpaca directory today! Each day AnimarooAlpacas.com gets thousands of visitors interested in everything to do with alpacas and alpaca breeders! Simply click the banner below to get started, select your category and submit your website. Listing your website takes minutes and is FREE with a link back to us! Click here to signup today, get your free listing NOW and get priority placement in your category! Find alpaca breeders from around the world or in your own back yard. See what's going on in your area or gear up to attend your favorite shows!